LAS VEGAS -- If this was truly Manny Pacquiao's final fight, as he has said, he went out with a near-vintage performance. In the best fight of their trilogy, Pacquiao, perhaps bringing the curtain down on his legendary, 21-year career, won going away, 116-110 on all three judges' scorecards. ESPN.com also scored it for Pacquiao 117-109. 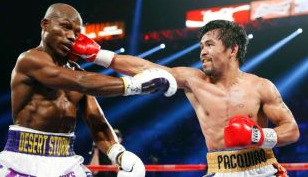 LAS VEGAS – If this is Manny Pacquiao’s farewell to the Sweet Science, the pride of the Philippines went out in style. Although not quite the boxing dynamo that took the world by storm in the late 2000s, boxing’s only eight-division world titleholder dropped Timothy Bradley twice after a slow start to win a dominant unanimous decision in front of a pro-Pacquiao crowd of 14,665 at the MGM Grand Garden Arena. After a career that spanned two decades, Pacquiao maintained that this fight would be his last. Nobody was quite sure what version of Pacquiao we would see. The last time Pacquiao was in the ring, he was thoroughly beaten by Floyd Mayweather Jr. in the biggest fight in boxing history that disappointed fans across the globe. As for Bradley, many were curious if the addition of Teddy Atlas to his corner would bring about a different result than the previous two engagements between the two. Even though the series was at one fight apiece heading into Saturday night, the prevailing thought was that Pacquiao was dominant in both performances. Gilberto Ramirez won the WBO super middleweight belt with a complete shutout decision over defending titleholder Arthur Abraham on the undercard of Pacquiao-Bradley III at the MGM Grand in Las Vegas. With the win, Ramirez became the first Mexican to win a major 168-pound title. Featherweight prospect Oscar Valdez remained unbeaten with an impressive fourth-round stoppage of former IBF beltholder Evgeny Gradovich on the Paccquiao-Bradley undercard in Las Vegas on Saturday. Valdez (20-0, 17 knockouts), a two-time Mexican Olympian, easily outboxed the rugged Russian in Rounds 1 and 2, controlling the distance with lateral movement and landing hard jabs and one-two combinations at will. LAS VEGAS – Light heavyweight Oleksandr Gvozdyk scored an emphatic one-punch, second round knockout over Nadjib Mohammedi to top off the non-televised portion of the Pacquiao-Bradley III card at the MGM Grand. Gvozdyk, who won the bronze medal at the 2012 Olympic Games, improves to 10-0 (8 KOs). Mohammedi drops to 37-5 (23 KOs).